Wave Turbine, energy generator, from the sea. This Wave Turbine is composed of 2 tanks or chamber that are connected by a pipe. The two tanks are opened at the bottom so the water can rise or lower its level depending if the crest or lowest point of the wave that is passing under the tank. In the middle of the pipe the Double Wind Turbine is positioned in a vertical or horizontal position. The 2 tanks are positioned about an average of a half wave length from center to center of each tank. Than as the wave travel under the tanks, one tank will produce a vacuum and the other a high pressure and so vice versa This action will produce a back and forth pressure of air which in turn will spin the turbine in one direction. Than the turbine axle is connected to a generator to produce power output. This system has one moving part therefore making it a reliable and low maintenance. Also it dos not use floats which is a limiting factor that limits the momentum of the system. But here the mass of the water that can be used is greater and will produce more power output. This Wave Turbine can be used out at sea or by the shore line. This system can produce energy 24/7. Also can produce power in the megawatt range. The omnidirectional Or Double Wind Turbine Used here will spin in one direction with this bidirectional force applied. The Double Wind Turbine is Composed of 2 turbines one inside the other. The system is very quiet because the air is traveling in a closed path. This makes this turbine very efficient. The picture here shown is of the system on the seashore. 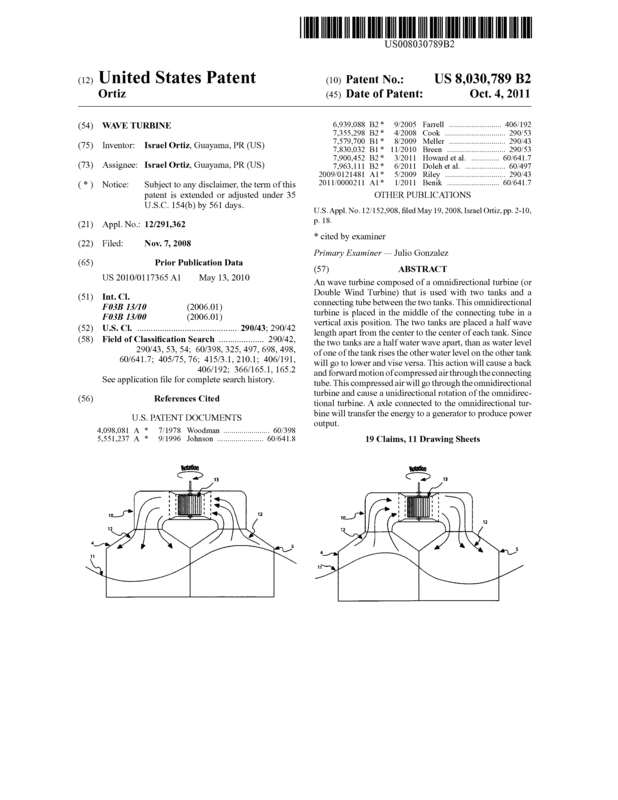 Page created at 2019-04-26 18:46:39, Patent Auction Time.